What do you think of when you think of Portugal? Is it the 3,000 hours of sunshine per year on average, or the year-round mild climate? Is it the wealth of religious and cultural heritage dating back to Portugal’s founding in the 12th century? Another possibility is the national parks and UNESCO sites of World Heritage? Alternatively, could it be the lush horizons of the Algarve, where fish, beaches, and water sports are the main focus? 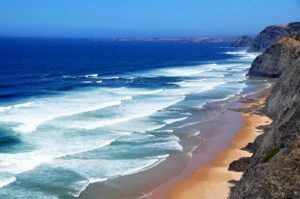 In this article we take a look at four of the most popular timeshare resorts around Portugal. Each one enjoys an ideal location for all aspects of this exciting holiday destination. Suitable for couples, families and groups, Clube Praia da Oura has something for everyone. Whether it’s a weekend break or a longer stay, the friendly staff will be happy to assist you. The apartments are in a hilly residential area with easy access to the beach (300m) and the centre (500m). The resort has its own supermarket for those visiting on a self-catering basis. You’ll also enjoy two pools with sun terraces for those days that just must be set aside for soaking up the sun. Most noteworthy for its old-country glamour is Four Seasons Vilamoura. It’s just a short walk or road train ride from the famous Vilamoura Marina. A child-friendly complex with a wide variety of facilities, it includes a gymnasium, sauna, and squash courts. Let’s not forget the heated indoor pool, Jacuzzi, and even a Kids Club during school holidays! While the kids are enjoying their own games and activities, play a few holes on the championship golf course or just lie back and relax on one of the Algarve’s breathtaking Blue Flag beaches. At time of publishing, Pestana Alvor Park Hotel is TripAdvisor’s number one hotel in the Alvor area of Portugal. As a result, it enjoys a fabulous reputation, and it’s easy to see why. Not only is it a recent build of 4-star calibre, its 55 luxury apartments all offer spacious lounges, kitchenettes and satellite TV. Some even feature spectacular panoramic views over the Atlantic! Furthermore, facilities for children include a fun centre and babysitting service. Take advantage of these and enjoy the pools, Jacuzzi and Turkish bath, and even the luxurious facilities at neighbouring hotel Pestana Dom Joao II. Especially relevant for those seeking a more exclusive destination is Pine Cliffs Golf and Country Club. The resort was created particularly to attract guests wishing to return year after year. As a result, it offers exclusive privileges to its owners. Enjoy breakfast on your private veranda or terrace whilst looking out over the golf course or the Atlantic Ocean. Apartments are sumptuously decorated with modern colours that perfectly complement traditional Portuguese architecture. Ideal for couples and families alike.